That was the headline of a Toronto Star article published in 1983 to describe the scramble that groups and organizations engaged in to determine what would be done with the hospital grounds. The mental institution had closed down four years earlier and the province was about to hand it over to the city. Community residents, developers, various housing groups, the Conservation Authority, Humber College, City planners, LAMP, Lakeshore Planning Council, Arts Etobicoke, Ministry of Government Services and area aldermen were just some of the interests competing at that time for this prime waterfront property before the negotiated, final mix of naturalized green space, passive recreation, art, education, heritage and healing was agreed upon and set out in the Master Plan for the park. The busy little sketch that accompanied that article is shown here (double click on image to enlarge it). 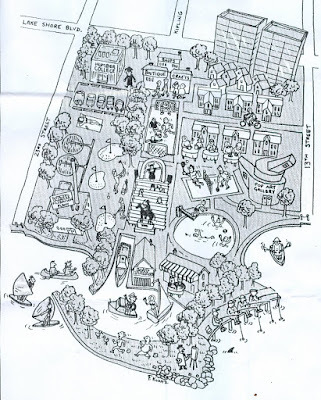 The newspaper’s artist attempted to illustrate what the park and grounds might look like if the ideas floating around were incorporated. It is interesting to note that one of the back-stories to the current skating trail proposal, the concern that it could lead to what was called at that time a “Harbourfront West” development model, had its genesis back then. The community buried that model before and is very wary of it resurfacing. WHAT REALLY HAPPENED LAST THURSDAY! DOGS IN THE PARK - A SOLUTION?